Winter is swiftly passing and spring is on the near. So I’ve been yearning to play with some flowers at home to create some simple art. 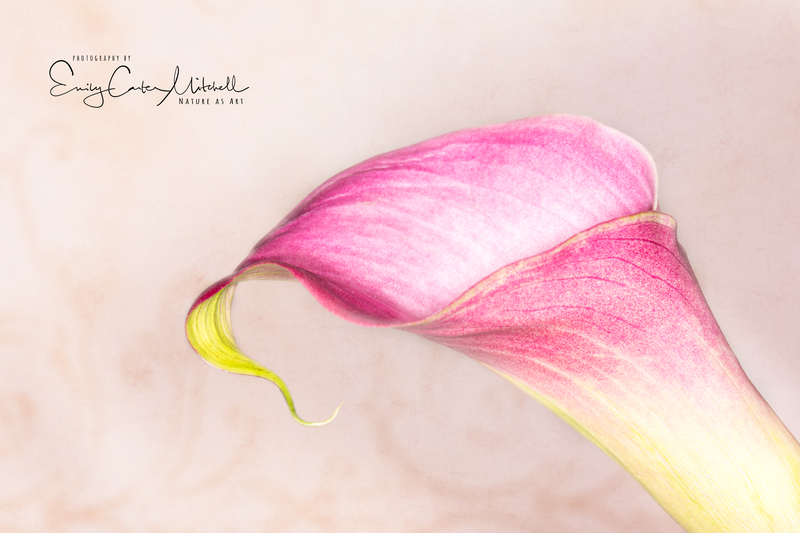 While at the store the other day, a tiny bouquet of calla lilies caught my eye for what I was thinking of working with. Setting a single blossom in a vase, I set up behind it a large white board with a scrap book decorate page that I had found in a craft store. Handholding my Canon 5D Mark IV with the 100mm lens, I wanted to a good part of the flower in focus, so attached a ring light. Selecting a high f-stop of f/18, ISO 100, 1/200 of a second and a focus point selected I took several images. With some minor edits in Lightroom, I brought the image into Photoshop and added a light texture to soften the overall look. Thank you so very much Carolyn. You are too much Herb. I must admit that the idea is not my original. I’ve been inspired by other photographers. 🙂 Thank you so very much for your thoughtful and generous comments. I love your interpretation, Emily. The added texture makes the photo even more appealing to my eyes. Wonderful and appreciate your feedback Isabella. Hope all is going well with you. Looks like one of my watercolors painting I’m trying to capture!!! Thanks Steve – I would love to see your work.